Discover the luxurious world of hair care with Oribe. Expertly blending craftsmanship, performance, and hair styling experience, Oribe is a best-selling hair brand which offers premium products utilising the most advanced technology. Formulated with fresh and modern ingredients, the extensive range of hair treatments and styling aids offer only the best results and created with fine fragrances from a legendary 19th-century perfume house, they offer a beautiful hair care experience. 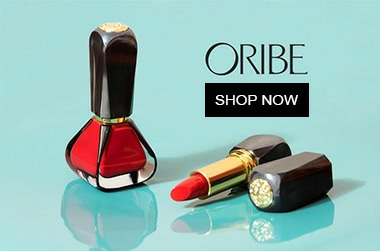 The Signature collection from Oribe boasts some of their most infamous products from the cult classic Dry Texturizing Spray to the opulent Cote D’Azur Hair Refresher. Start your hair care routine with the Oribe Signature Shampoo. Encased in a striking black bottle, imperitive of the Signature range, this rich daily hair cleanser helps to silken, detangle, and protect locks while ridding it from impurities and product build-up. Suitable for all hair types, the weightless formulation glides effortlessly through the hair to deliver a healthy look and feel. Follow with the Oribe Signature Conditioner for additional moisture and protection. When it comes to hair styling tools, Oribe offer an abundance of products so no matter your hair type you can enjoy salon-finish lock everyday. The Dry Texturizing Spray has become a firm favourite, building volume and texture for an eviable tousled look. The Superfine Hair Spray is another must-have, setting your hairstyle in place all day with a flexible, brushable, and shiny-soft finish. To enjoy the iconic Cote d’Azur fragrance all day long, Oribe now offer the Cote d’Azur Eau de Parfum and Scented Candle so you can appreciate this gorgeous scent in more than just your hair care routine. I love oribe super fine hair spray. It smells amazing and does the job by keeping hair in place. It never makes my hair look too done or overly done. Still allows some movement if I don't spray my hair like crazy. great for my purse and it last FOREVER! My go to hair spray. Definitely expensive but works the best out of all the spray I've used. Love this spray, it instantly leaves my hair feeling softer and gives it a wonderful gleam. Easy to apply and doesn’t have that greasy feeling a lot of other similar products do. I wouldn’t buy anything else.